Over the last few years, we have looked at some of the finer points of writing: tricky little details about spelling, grammar, punctuation, and word usage. While I believe those topics are useful—even vital—for the professional content writer, today we are going to take a look at writing on a different scale: the sentence. If we imagine that words and punctuation are the atoms of content writing, then sentences are the girders of your composition. We want our sentences to provide a firm framework for the essay, blog, or article that we are writing. 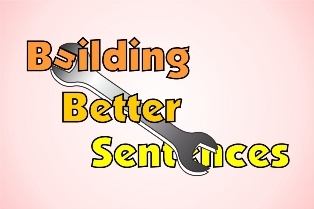 As it happens, looking at ways to strengthen our sentences yields some helpful insights...and it requires less jargon than the typical discussion of grammar. Of course, you should not abandon your other writing standards in order to pay more attention to the sentence level. You must still use correct grammar and proper punctuation. Neglect those, and you are no longer communicating—you are just making grunts and whistles. Following the principles listed below won’t make you a perfect writer overnight. I believe, however, they will help lead you to becoming a better writer, and lead you toward becoming the best writer your talent allows. Every sentence should help propel your essay forward. A sentence should concentrate on a single idea. A cluster of nearby sentences—in the form of a paragraph—should build a logical progression of ideas that work together to advance toward your conclusion. Each sentence thus has a unique function: bridging the gap between the ideas that came before and the ideas that follow. Now, don’t take this as an order to outline your essay at the sentence level. Some sort of outline is always a good idea, even if it is an informal plan for your composition. For instance, in writing this blog post, I first composed the headings and subheadings, and then each section of text under them; I finished by writing the introduction and conclusion. This allowed me to keep in mind my short-, medium-, and long-range goals for the piece, and to craft my sentences appropriately. Choose action verbs over copula verbs, when you have a choice. This cheese is a little moldy. Eva’s kitten was always nervous around strangers. Opera singers sound unpleasantly screechy to my untrained ears. Todd smells like he came from rugby practice without hitting the showers. Copula and copula-like verbs do not add much to the sentence. They just function as an equals sign to signal an equivalence between the subject and the predicate. A verb that indicates activity—even purely mental actions—makes a stronger impression on the reader. Clearly, copula and copula-like verbs can’t always be avoided; they are just so darn useful. But when your editor or proofreader reviews your work, he should be alert for opportunities to swap in active verbs. Did you cringe while reading that? I did. There are three variations of the word “perform” (and two of “theater”) crammed into one sentence. The author seems to have either a very limited vocabulary or a fixation about certain words. If the pattern continues throughout the essay, the droning effect will distract your readers, put them to sleep, or send them off to another website. Avoid using the same words in a short space. The longer and more unusual the term, the greater should be the gap between its appearances. Likewise, be careful not to repeat an uncommon metaphor within a single document, and watch for other regular patterns of word use. For example, I know one writer who consistently begins each paragraph with “really,” “unexpectedly,” “actually,” and other sentence adverbs. If you find yourself developing a similar habit, revise your writing to cut the repetition. Wordiness is a bad thing. One of the touchstones of writing well is to use no unnecessary words. Does that mean you have to prune away all description, erase all adjectives, and reduce your style to the level of “Run, Spot! Run!”? Not at all. But don’t stuff your work with jargon just to impress the reader. Don’t forget your topic and wander off to explore an unrelated idea. Don’t use multisyllabic Latin-derived words and complex sentence structure when that doesn’t serve your readers’ needs. Let’s emphasize this point for those people who write online content for business promotion. Many of the people consulting your website will not be strong readers. Only desperate circumstances would drive them to try to locate a law firm, medical practice, or service business. They will quickly look elsewhere for help if your prose is too hard to read. So controlling your urges to write challenging prose turns out to be essential if your business is to prosper. Some writers embrace the idea of word economy too rigidly. Their output shows frightening regularity: every sentence has six to ten words, every paragraph has exactly three sentences, and there’s a heading after every three paragraphs. It is prose that a robot would produce, and every bit as exciting as it sounds. A well-written essay should use short sentences, medium-length sentences, and the occasional long sentence thrown in for variety. Simple sentences should share the space with compound, complex, and compound-complex sentences. Throw in a rhetorical question now and then, too. Conversation avoids extreme regularity because it would be monotonous; written prose should follow the same rule. Mix it up! Life. That is the word I was looking for. “Variety is the spice of life,” according to the proverb (and the headline above). But “Life,” by itself, isn’t a sentence. It is just a noun. We have all been taught to write in complete sentences, and that means a noun phrase and a verb phrase at the very least. If you have only one of those, or a lone adjective, or just a prepositional phrase...well, that is just wrong, isn’t it? It’s a sentence fragment. We are not allowed to use them, are we? Balderdash. Sentence fragments are technically against the rules of grammar, but you can deliberately ignore grammatical rules in anything but the most formal documents. You should not use fragments too often, and you should use them thoughtfully for a specific effect. Sentence fragments can startle a reader and force him to refocus on your writing. Use them judiciously, but do use them. It is surprising how a modern art gallery can provide inspiration to a young writer. Sky-driving is something everyone should try at some point in his life. As I headed back down the stairs, I could hear the tolling of a bell in the distance. Writer, you will be surprised by the inspiration provided by a modern art gallery. At least once, everyone should try sky-diving. As I headed back down the stairs, in the distance I heard a bell tolling. This one blog post does not point out a shortcut to becoming the Next Great Content Writer of Our Time. But that has never been the purpose of these articles. Improving one’s writing skill is always an ongoing project, and I hope that each of these pieces nudges you a little farther along the path. Please take the time to read more on our website, where the amazing members of the Foster Web Marketing team share the secrets of website design, search engine optimization, social media integration, and dozens of other topics. And, while you are at it, visit our Facebook page and see what’s happening with our business today. You're most welcome John :) Thanks for sharing that with us, those are my exact thoughts as well! Thank you for the kind remark, Duke. I've looked at Hemingway and I've read positive reviews of it; I can see how some writers will find it useful. I think its greatest strength is that it explains the reasons behind editing suggestions; that should help reinforce the principles of good writing.